Hexen: Edge of Chaos is a new game that is based on popular game Doom 3. 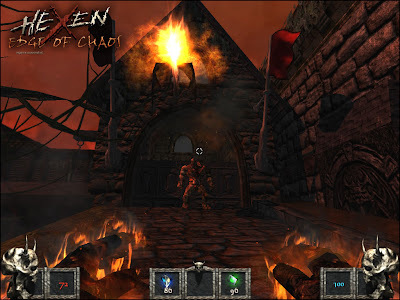 Developed by fans of the Hexen series the game is a hack 'n' slash game inspired the original Hexen game. "heXen:Edge of Chaos will be a new and free game, based on the original Hexen game which was developed by id Software and Raven Software. Edge of Chaos is being developed by a team of fans who have always loved the original Hexen since it came out. When id Software released Doom3, we immediately saw immense potential in the engine itself; the 'Hell' maps gave us the inspiration to make a hack-and-slash game based, primarily, on the original Hexen." "The game will be released in three episodes, each based on one character class. Our first demo release, an excerpt from the first episode, is based on the Cleric class. The second and third episodes will be based on the warrior and sorceress class respectively. We've chosen to use an episodic approach in order to create a manageable release schedule."